The union that's dividing America. Jim de Seve's documentary may not be a good example of good pacing, but rather than making a political or religious argument by and large about the issue of gay marriage, it presents what one simply could not refute, what no one can justify in opposition: Personal individual, and highly unlikely, filmed documents of cases in which it is made perfectly clear that civil unions cut no ice in court, made loud and clear that even some of the most likable working people you know are voting for politicians who cause these horrible things to happen to decent people, people who are gay and nonetheless had the most remarkable relationships of any of those around them, most of whom are very loyal and understanding to these people, whose stories you will never quite live down, or understand how anyone could live them. This enraging low-budget film anesthetizes us a little with its binding array of well-versed speakers and heated sound bites from supporters and opponents correspondingly as it follows the history of marriage, but I am not sure how well one will remember most of this by the end of the film, because what will be resonating are its very personal chronicles of two such ill-fated unions. One account concerns the marriage of lesbian Florida police officers, sadly severed a decade later when one was fatally shot in the line of duty. The deceased's family, who had hardly kept in touch with her and only when the possibility of finding a loophole in her civil union to get the money she left for her grieving lover, they show up. Even more heartbreaking is the story of Oklahoma farmers Earl and Sam, who lived together for 22 years and raised Sam's three sons from his previous marriage. Earl willed the ranch to Sam, as well as making him beneficiary of his 401(K) retirement fund. But the family, who again had not been in contact with Earl for many many years, opposed and not only kicked him off the property, but demanded back rent from Sam, who has had to sell his horses and still can't pay the bill. No one deserves these lives, except maybe for those who are inflicting this kind of infuriating suffering and glaring, barbaric injustice. The director of Tying the Knot De Sève justly depicts gay marriage as a civil rights issue. Frankly, why would anyone dispute a documentary for not giving a voice to bigots or to discrimination? Nobody would advise such elaborate balance with a documentary about slavery or women's suffrage. But he does give a fair amount of time to significant opponents James Dobson of Focus on the Family and Sen. Bob Barr, sponsor of the ridiculous and groundless Defense of Marriage Act. The film begins with archival footage of a 1971 demonstration at the Manhattan city clerk's office and ends with the cancelling out of 4,000-plus marriages in California and 2,000-plus in Virginia in 2004. 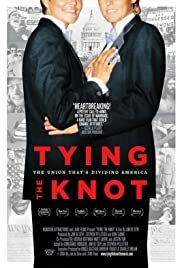 No matter which side of the case you are on, Tying the Knot is worth seeing for its relevance and how powerfully it humanizes such an issue that people just like Earl and Sam and those Florida cops are voting to perpetuate.